Sometimes, not too frequently, but sometimes, I'll hear someone mention that they don't really like vegetables. If this person is a stranger, I just smile politely and shrug. If this person is my friend, I mentally go over their good qualities to remind myself there are other reasons we get along. I mean, I'm not saying I'll stop being friends with you if you diss vegetables, but I'm not not saying that it makes me question you just a little bit. In either case, I remain utterly sure of my rightness about vegetables, that they are just amazing, period, and by far the most interesting part of any meal (Except beets. They taste just like dirt and do not try to convince me that I only need to try the golden ones or roast them or add goat cheese. It does not help to do any of these things). Luckily, many restaurants have caught on to the idea that vegetables can step into a starring role, and in the last few months I've been blown away all over again by what creative chefs can do with the plant kingdom. There were carrots in Sydney, two back-to-back trips to ABC Kitchen and abcV in New York just last week featuring yet another carrot dish I want to eat forever and some truly spectacular sauteed artichokes, as well as many more instances where I know I was the person at the table suggesting we just make a meal of all the sides. I'm not saying I'm ready to go vegetarian, because there is still a place at the table for bacon, steak, roast chicken and all the rest, but maybe we can just move it all to the "side dish" category and focus on the exciting part with all the rainbow colors. Fortunately, that rainbow includes orange cauliflower, which is really just regular cauliflower with a colorful gene mutation. 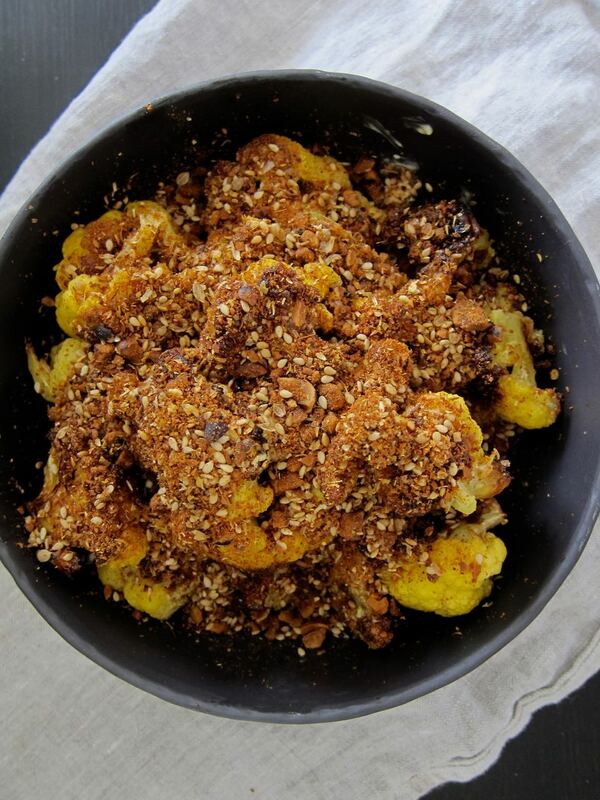 I've taken it here and prepared it in perhaps the most decadent way possible short of smothering in cheese: fried in olive oil, tossed in butter, and then buried in a fragrant mix of nuts and spices. It's indulgent and flavorful and worthy of the center of your table. Dukkah recipe adapted from Jerusalem, minus any hard to find ingredients. Heat oven to 325. Roast hazelnuts for 10 minutes, then add sunflower seeds to baking sheet (keep separate from hazelnuts) and roast another 10 minutes. Remove from oven and let cool. Toast seeds. Heat a heavy skillet over medium heat for 5 minutes, then add cumin seeds and toast for 30 seconds. Transfer to a bowl, then toast coriander seeds for 1 minute, transfer to another bowl. Lower heat and toast sesame seeds until fragrant and starting to pop. Transfer to a bowl. It's important to keep all seeds separate. You want the flavors to remain a bit distinct even while blended. 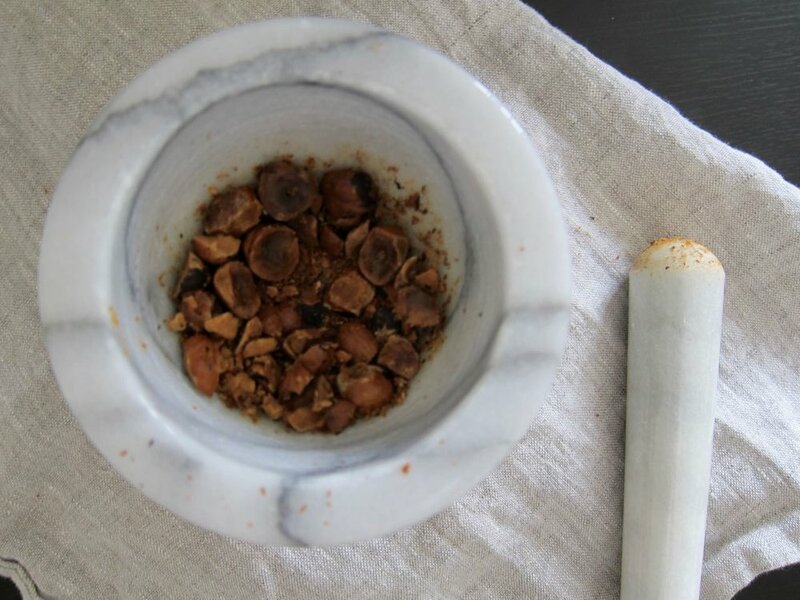 Rub hazelnuts together between your palms to remove as much of their skins as you can. Coarsely pound in a mortar and pestle (or if you don't have one, seal in a plastic bag and pound with a rolling pin) and transfer to a mixing bowl. Crush the cumin seeds and add to the bowl, repeat with coriander and sunflower seeds. Add sesame seeds to the bowl, then add salt and paprika and mix all together. Set aside until needed. Heat a good amount of olive oil in a heavy skillet over medium-high heat. Cut cauliflower into florets, then fry until crisp and tender, checking for doneness with a fork. Transfer to a serving bowl or platter, toss with the butter, a pinch or two of sea salt, and a few squeezes of lemon if desired. Top with the dukkah and a few grinds of black pepper. Serve hot. I don't call for them here, but a couple handfuls of golden raisins added to the cauliflower before tossing in the butter is quite an excellent addition.